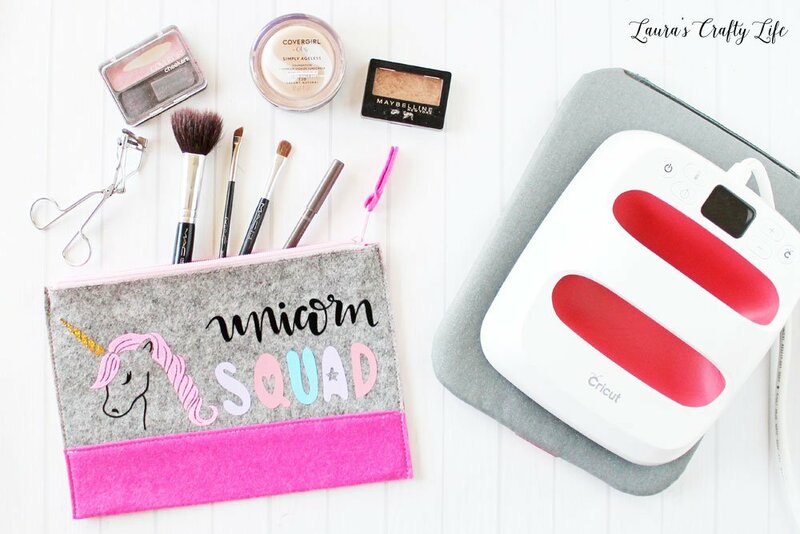 Unicorn Makeup Bag | Cricut EasyPress 2. 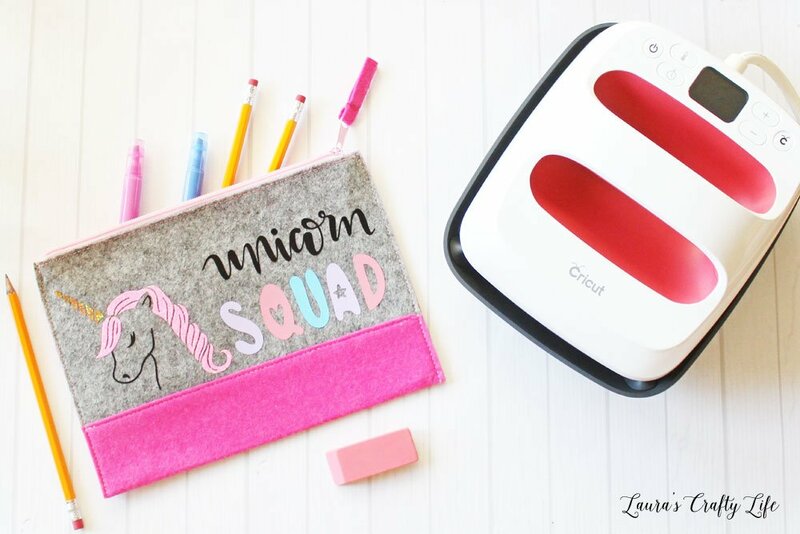 Learn how to create this adorable unicorn squad makeup bag using glitter, holographic, and every day iron-on with the Cricut EasyPress 2 and Cricut Maker machine. Unicorns are all the rage right now. 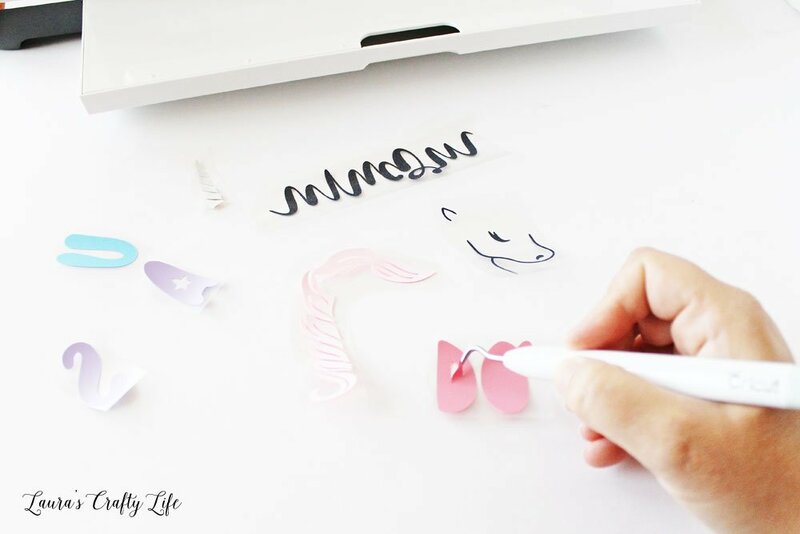 There are a ton of adorable unicorn designs in Cricut Design space. 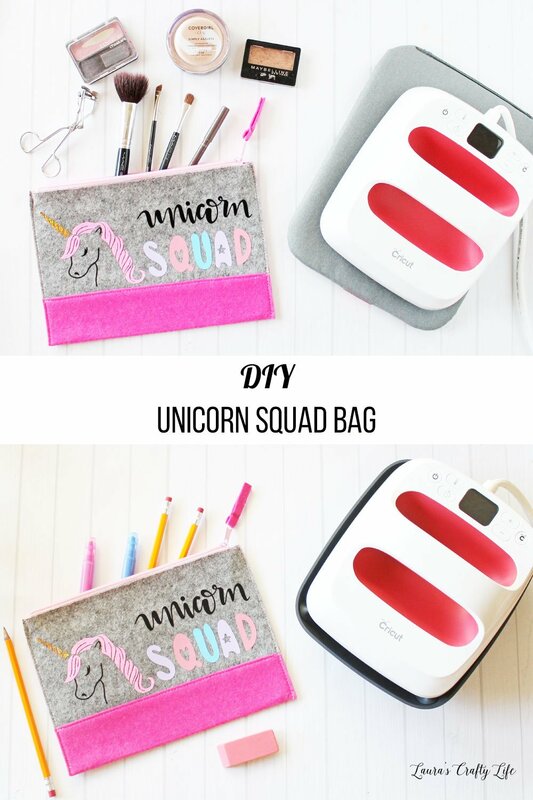 I thought it would be fun to dress up a plain makeup bag with iron-on and some cute unicorn designs. This post contains affiliate links. If you purchase something through the link, I may receive a small commission at no extra charge to you. Please read my full disclosure policy here. 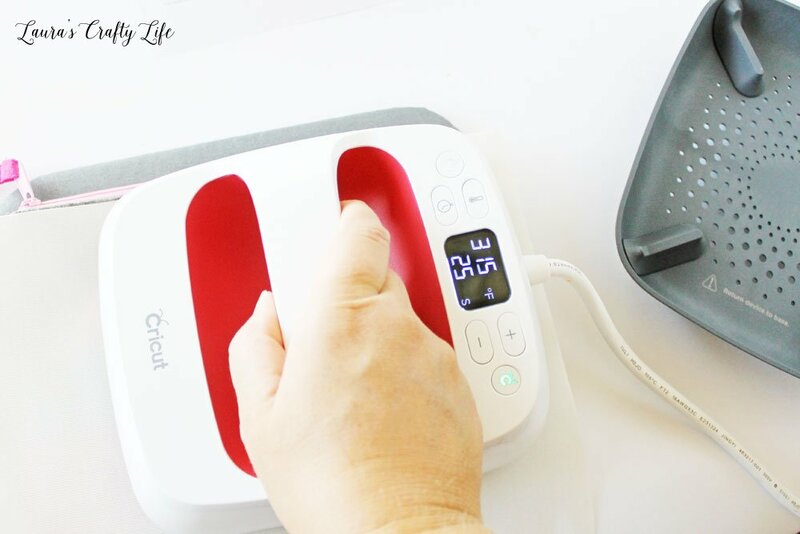 Thank you to Cricut for sponsoring this post, providing me with a machine, EasyPress 2, and some of the products for this post. I have a confession to make. I don’t own an iron. I never iron clothes and only used the one I used to have for crafting and sewing. 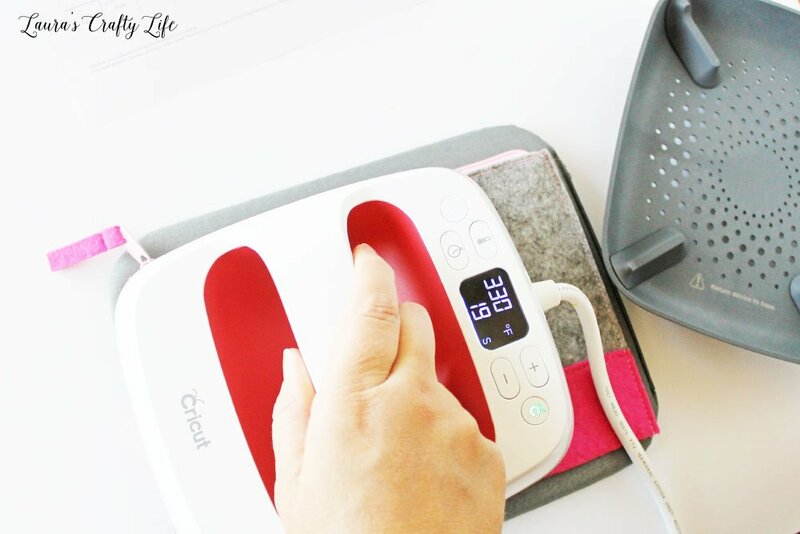 I was so excited when Cricut came out with the EasyPress last year. It was the perfect tool for the types of projects I was working on. 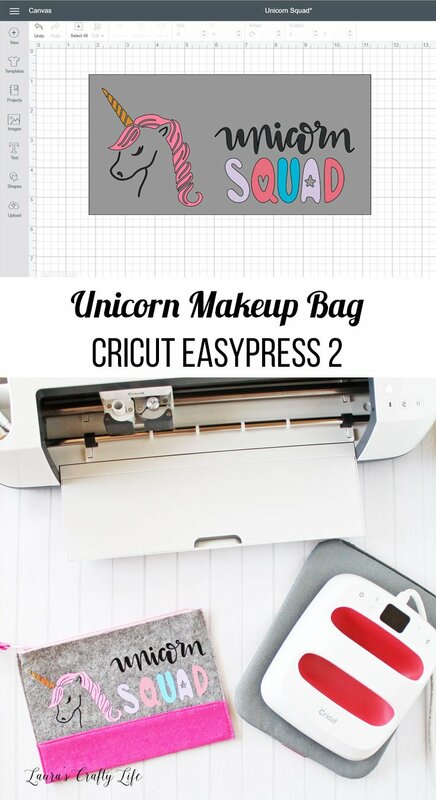 This year, Cricut has come out with the EasyPress 2. It heats up faster and now comes in three sizes – 6″ x 7″, 9″ x 9″, and 12″ x 10″. I often work on smaller projects and sometimes my original EasyPress can be hard to work with. The 6″ x 7″ EasyPress 2 is perfect for my smaller projects. *Cricut’s StrongBond™ Guarantee means that when this iron-on material is used as directed, you’ll be completely satisfied with the results. If not, we’ll replace it for free. Look for the StrongBond™ Guarantee on select iron-on materials. I found an adorable little bag at Target in the Bullseye’s Playground (formerly the Dollar Spot). It was only $1. 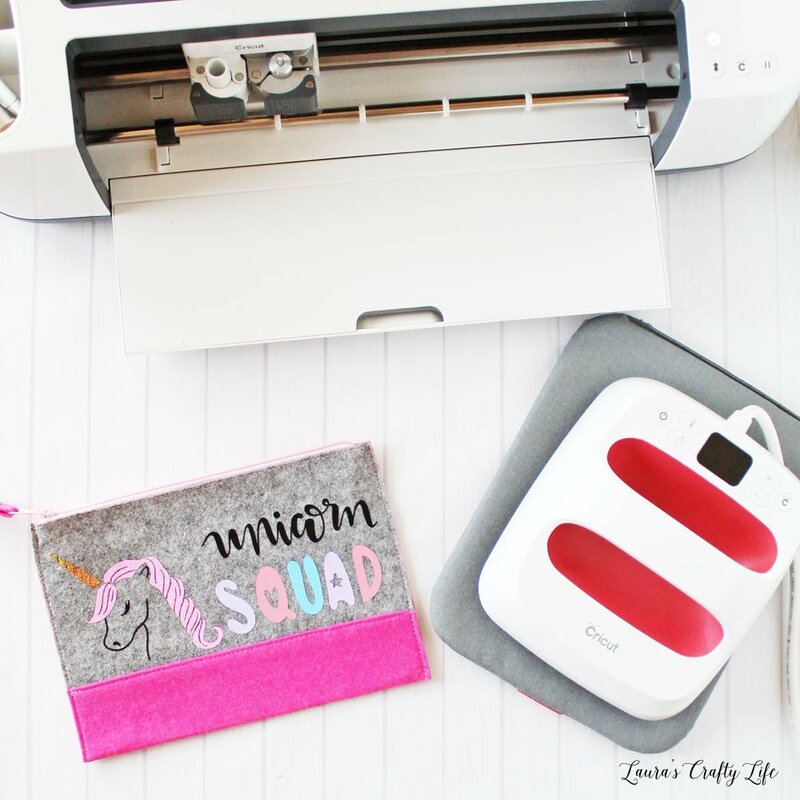 They always have great little bags, banners, signs, and towels that you can purchase inexpensively and customize at home with your Cricut. 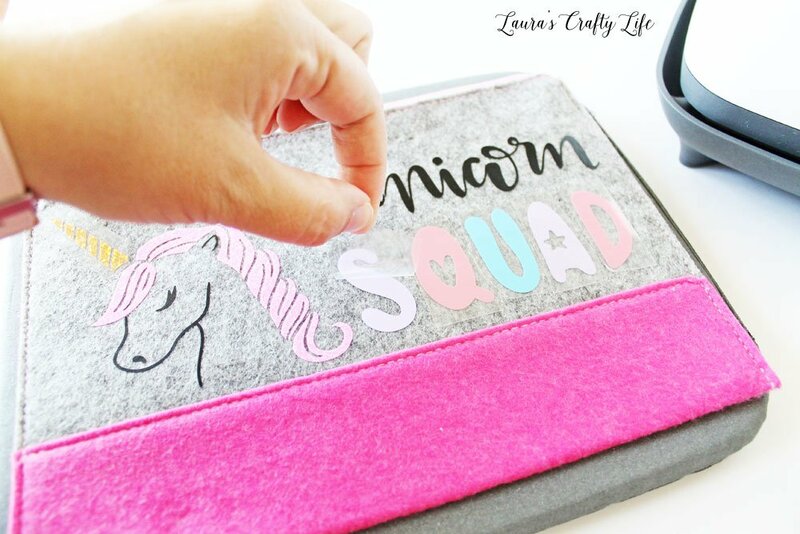 I started by finding some cute unicorn designs in Cricut Design Space. I used the Unicorn Head 2 (#M6D6499F) and Unicorn Squad (#M6D64A46) images. Change the colors of each layer to match the colors of iron-on to make it easier to cut out all of the different parts of the design. I was going to use on this project. To make sure all the layers of iron-on would fit, I added a rectangle in the same size as my makeup bag. Note: There is no need to cut out the rectangle background layer for this project. Simply click the little eye next to the rectangle layer so that it is not visible before clicking Make It. 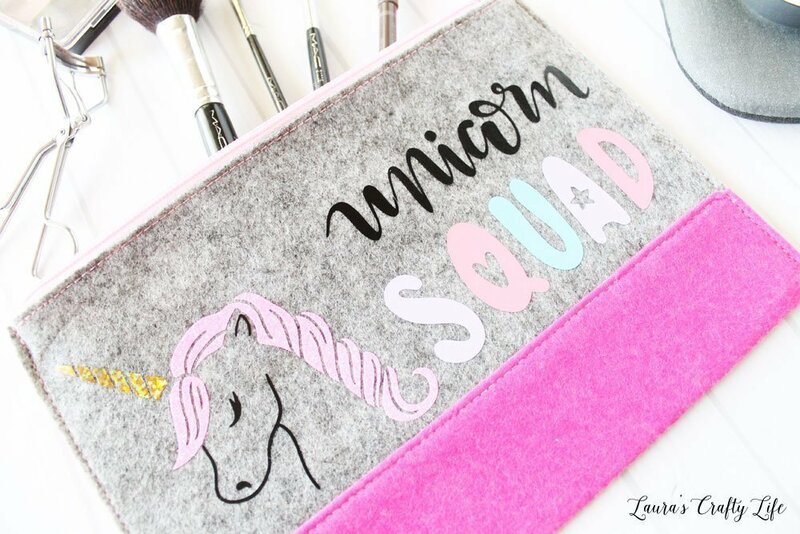 You can also resize the rectangle and then the unicorn images to fit your particular makeup bag. Once the design looks how you want it, click the green Make It button. This will take you to the mat preview screen. Make sure every mat has the Mirror option selected. Click Continue. Select your machine and then double check to be sure you have the correct material selected. I used a mix of iron-on, holographic iron-on, glitter iron-on, and every day iron-on for this project. Before cutting each mat, I made sure the corresponding material was selected to which mat I was cutting out. Always place iron-on (shiny side) face down on the mat. Cut out all parts of the design and weed everything using your weeding tool. I like to trim off the excess liner so that I can iron-on most of the design at once. You don’t want any liner overlapping where the design should be adhering to the base layer of your project. Turn on your EasyPress 2 and let it heat up. Start with the materials that require a higher temperature and iron them onto the fabric first. In this case both the holographic and glitter iron-on needed to be pressed for 30 sec at 330°. All of the iron-on I used for this project requires a warm peel. This means to peel off the liner from the fabric while it is still warm. After the glitter and holographic iron-on were in place, I laid out the rest of the design on my makeup bag. Everyday iron-on and iron-on lite both need a setting of 315° for 30 seconds. I used an iron-on protective sheet over the design, so I didn’t ruin the glitter and holographic iron-on. Peel off the liners on all the rest of the iron-on while it is still warm. 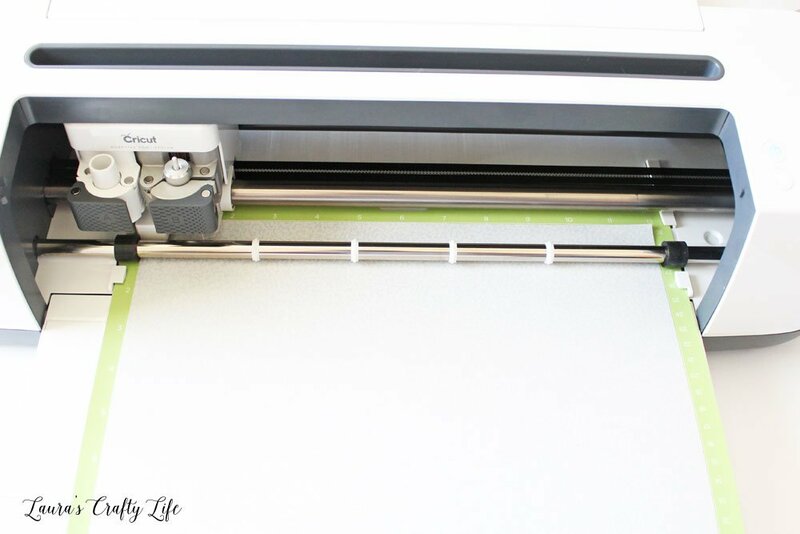 Helpful Tip: You can print out the Cricut EasyPress 2 recommended settings for use both with or without a Cricut mat here. The makeup bag turned out so cute! It is a great size for holding my everyday makeup. 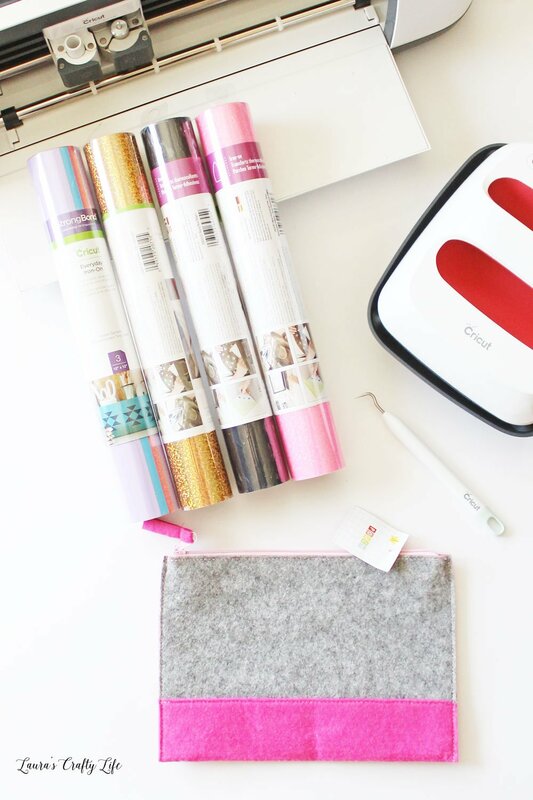 I love that with just a few supplies I can customize just about anything! I think it could also make an adorable pencil pouch for school. You could add your child’s name to the front or the back to further personalize it. Oh my goodness, my niece would just adore this. Thanks for the great idea! I have to confess, I am not much of a unicorn person, but she sure loves them! My daughter loves all the unicorns, too! I think they can be pretty cute. I am sure your niece would love a little bag like this! My daughter would absolutely love this unicorn bag! I am actually thinking this would be a super cute party favor to give at the end of her birthday that her friends would totally love! I also can’t pass up any excuse to whip out my Cricut Maker and brand new EasyPress 2 – I haven’t even taken it out of the box yet! Thanks for the inspiration! These would make adorable party favors! And usually, the little bags in the Target dollar spot are not too expensive.